Need a haircut, facial, or massage? Head Games salon in Portland has you covered! You can get pampered for a great cause! 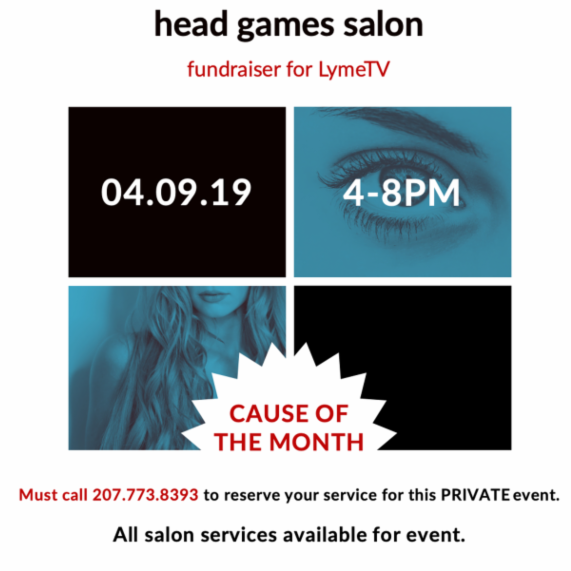 They have named LymeTV Cause of the Month for the second time and, on April 9th from 4-8PM, are donating 100% of all salon service proceeds to LymeTV. LymeTV (founded by EFDM student Julian’s parents) has many programs geared to tick-borne disease prevention and information. This is especially important in Maine since the state has the highest incidence of Lyme disease in the nation. Please call the salon at (207) 773-8393 to book a service for this benefit event! There will be complimentary food, adult beverages, and a FREE raffle entry for a Tiffany & Co. necklace! Don’t wait, book today! See you there!